This Sunday I was invited to Omiš to enjoy a walking tour of this historic town located right on the mouth of Cetina river. Omiš has one of the most spectacular positions on Croatian coast matched maybe only by the location of Šibenik. That, and the very nature of the locals, enabled this tiny town to preserve it’s independence from the powers that were ruling Dalmatian coast at the time. History of Omiš is captivating and still alive! In 1409 Ladislav Napuljski sold Dalmatia to Venice, and Omis was finally conquered in 1444. With the fall of Venetian Republic Omis came under the Austrian rule, and it was under French rule until 1813, when it finally became the part of Austrian empire till the beginning of First World War. Two churches out of total of 8! 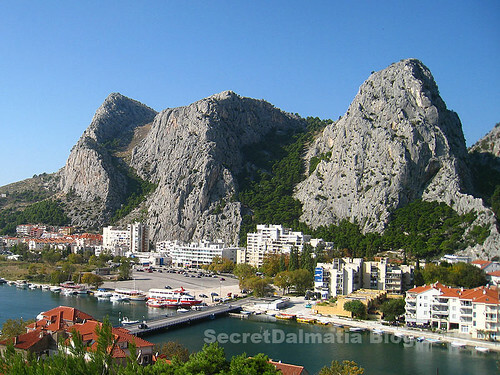 There is also a great sandy beach that makes Omis a great holiday spot for whole families. Besides beaches and culture, Omis is very close to Cetina river canyon and about 20 local agencies are offering rafting and canyoning on Cetina. The view from Mirabella is a great reward for this climb! Not only that one can see all the way to Brac and the islands, but the panorama of Omis itself is wonderful! Mirabella fortress split in half in 1982. after a thunder struck the structure! One half of the tower collapsed down the hill and crashed several houses bellow. Luckily, no one was hurt! Thanks to the powerful local politician who was in power at that time, fortress was fully restored. Omiš makes a wonderful day trip from Split – perfect for shore excursions out of Split for people looking for historic little town and light activity. Of course, rafting is also a great option as well as hiking in the hillside of Omis Dinara. More unique travel in Croatia opportunities! Learn more about Omis at Sightseeing Croatia!